Many investors talk about the importance of investing in capital cities in order to earn capital growth, but there are also a lot people who want to invest in positive cash flow properties. 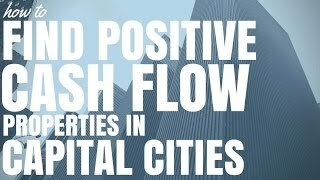 Capital cities and positive cash flow are not generally two words you hear together in the same sentence but I am going to give you some of the techniques that I use to find potential positive cash flow properties in capital cities. First, I want to let you know that they do exist but are difficult to find. In a lot of circumstances you may need to create these properties yourself. It probably won’t a positive cash flow property the day you buy it but it might have the potential of positive cash flow inside it . It’s like buying a rock with a gold nugget in it. How much would you pay if I offered you a 20kg stone – just a stone that’s it? Now let’s say inside of that stone is a 1 kg gold nugget. If you knew that then you would buy that stone, crack it open and dig the gold out because it’s so valuable. It’s the same idea in capital cities. There are a lot of properties out there and some are just solid stone but every now and then you’ll come across a property that has a solid stone exterior with gold nugget of potential positive cash flow inside of it. 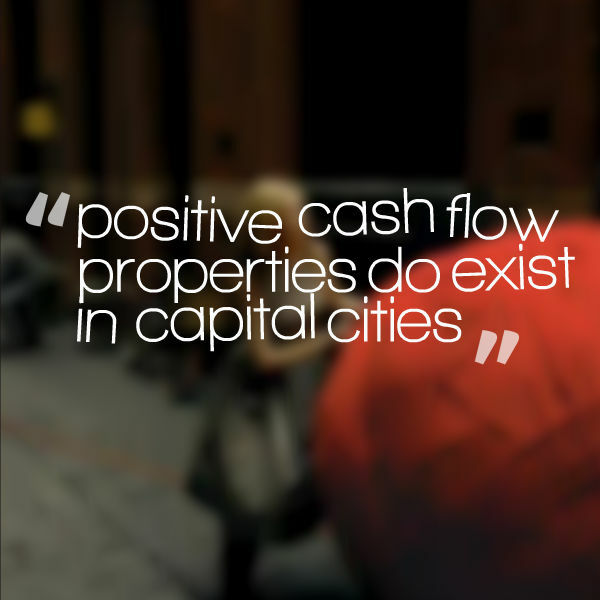 So how can you find positive cash flow properties in capital cities? Within a capital city there are many different suburbs. Sydney has over 4 million people and there are many different regions. Looking at different regions you see very different suburbs all across Sydney with different people, economies, house prices, and rental yields as well. Even areas within these regions vary greatly. 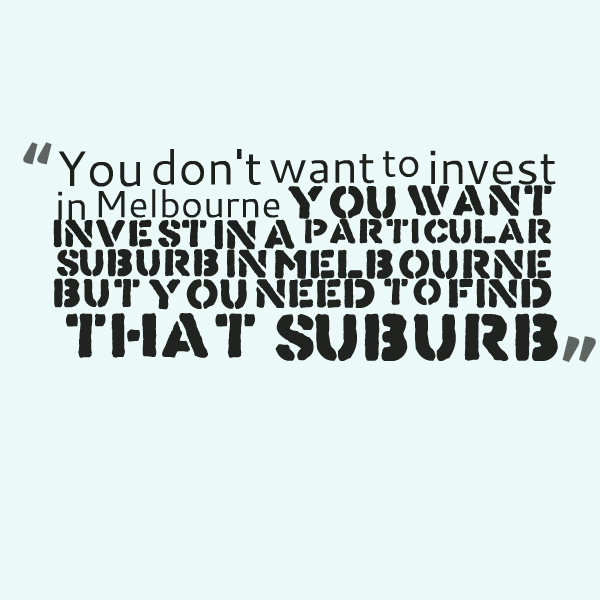 So you can’t just say, “I want to invest in Melbourne.” You don’t want to invest in Melbourne you want to invest in a particular suburb in Melbourne but you need to find that suburb. That is where doing your research comes in. What you can do is go out and get a property investment magazine. Then if you flip to the back of it you can find properties and suburbs by the capital city or postcodes. You can get so much information from just one magazine. Start your research by going through some of the suburbs that are in the capital city that you want to invest in. Then begin highlighting the suburbs that may look attractive to you. Once you find a suburb that you’re interested in and decide to do more research, I recommend looking into the news of the area and find out if there are any developments or improvements to the infrastructure of the area as a whole. When you’ve done some research into those aspects, then you can start to see whether there’s an opportunity or not. Start searching in the area you like for types of properties that are going to generate higher rental yields. These tend to be properties that other people might avoid so they do have added risk associated with them. I always start by looking at the cheapest properties on the market and assessing the rental yield there because I’ve found that as you go up into the median house prices and above, rental yields actually aren’t as high as they are at the bottom of the market. That means that if you see that cheaper properties have really low rental yields then chances are as you view higher priced properties you’re not going to find anything that good. Also, look at studios, one-bedroom properties or properties that you could rent by the room. For instance, you might be in a student accommodation area where you can rent a four-bedroom house to 4 different people and therefore generate a higher yield for yourself. These are different types of properties that may generate a higher rental yield for you because if you’re in a capital city, buying a standard two or three-bedroom house isn’t necessarily going to generate you a positive cash flow right away. So that’s why you need to get a little creative and start looking at other options. You can even look into properties that you would be able to convert in order to house more than one tenant. Now converting into dual occupancy is going to require some work but if you can get it done then you can increase your rental yield in a capital city. The key thing to do for this option is to look at floor plans. You can go on websites like realestate.com.au and find a floor plan to see if you could create a dual occupancy property. I was talking with Wally Gabriel from GrannyFlatSolutions.com.au (I interviewed him in episode 112) and he was saying that in some cases granny flats (which only cost around $100,000 to build) were renting for $600 per week. That is over 30% rental yield on the construction costs. So if you can purchase a property and a build granny flat on it then maybe you can increase your rental yield of the overall investment and actually convert what was a negatively geared property into a positive cash flow property. Granny flats have become much easier to build in the last 3-4 years and something that is well worth looking into (obviously though there are extra construction costs that you need to take into account when making your decision). Remember that positive cash flow properties do exist in capital cities but it’s generally not your standard three-bedroom house that everyone wants and usually it’s something that’s a little bit different or that you can convert to be different. I hope that this has helped and encourages you to search for property investment opportunities in capital cities.